Prime Minister Tuilaepa Dr. Sa’ilele Malielegaoi is right. There is nothing unusual about a business taking out a loan as part of its daily operations. It happens everywhere in the world, even to the biggest of businesses. Samoa Airways therefore is certainly no exception. But perhaps someone should remind Tuilaepa and his administration that Samoa Airways is a publically owned company. As such, when they do take out a loan, whatever spin they put on it, members of the public will end up paying. That is the undeniable truth. Besides, we are not talking about a few hundred talas; we’re talking millions here that will take years to pay. For the uninitiated, the country’s national airline Samoa Airways has asked the Unit Trust of Samoa (U.T.O.S.) for a $12 million loan. Confirming the application, the Minister of Public Enterprises, Lautafi Fio Purcell, told your newspaper that it is part of the back up plan to help the airline, which has been flying since November last year. It is no secret that a lot of questions have been raised about the profitability of the venture and whether it has the ability to survive the cut throat business of international aviation. This is why the idea that Samoa Airways is already loaning immediately raised eyebrows. But the Minister was quick to shoot down the suggestion that the loan is a rescue package to bail out the airline from its financial struggles. This, he said, is why Samoa Airways has asked U.T.O.S. for help. The Minister insisted that the Airline was not in a financial conundrum. Prime Minister Tuilaepa also showed the same confidence, dismissing suggestions that the Airline is desperate for some cash. “That would be the move taken by an intelligent C.E.O. 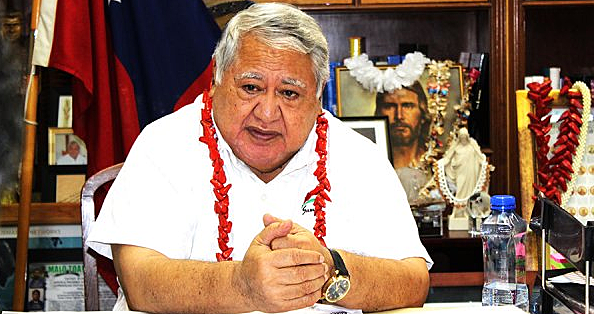 when there are no funds to carry out the operations of the business,” Tuilaepa said. Now let’s just slow down a bit. Is the Prime Minister saying the Airline has no more funds? And if that is the case, what happened to them? Where did they disappear? And how can they continue to operate under such circumstances? He concluded that there are “no hidden agendas” behind the Airline’s loan request. Where did the Prime Minister come from with this hidden agenda garbage? Since when did a media company asking a simple question about a public company borrowing money classified as a hidden agenda? Never mind the Samoa Observer. It is a private company. When it comes to Samoa Airways, we are talking about a publically-funded airline that the poor taxpayers of this country will have to fork out money to bail out if they don’t get it right. Besides it’s not the Samoa Observer that nearly bankrupted this country a few years ago. Remember Polynesian Airlines and how its finances became a serious threat to the national economy? Has this Government forgotten how the airline had jumped from a one Boeing aircraft to a four-Boeing fleet all the while its debt had ballooned to “over $50million” that it nearly bankrupted this country’s economy? Let’s hope we are not seeing a repeat of history here.